New restaurants rarely open in Concord so we were excited to check out the Buffalo Wild Wings on Loudon Road. Based on our recent experience, you may want to skip this one. 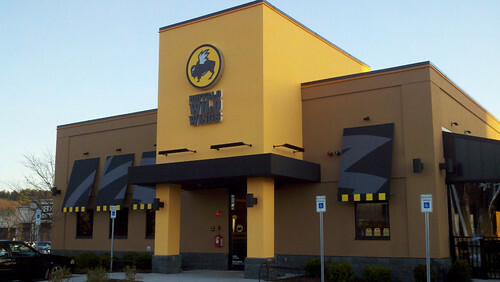 According to their form 10-Q that was filed on November 1 they had 343 company owned and 511 franchised Buffalo Wild Wings locations throughout the United States. The Concord store is the first in New Hampshire outside of the seacoast area with one in Rochester and the other in Newington. You would think that they must be doing something right with so many restaurants but we are having a difficult time figuring this one out. Our arrival on a recent weekday was met with trepidation, circling the parking lot for 10 minutes with no luck finding a space. It seems that they may not have enough spots for the huge crowds they are getting with everyone wanting to try Wild Wings. A few days earlier, when we walked into the restaurant, we were told there was a 40 minute wait so we decided to come back at a different time. As you enter a couple of things strike you, first, this is a loud and noisy place with music blasting in the background. Second, it is a large space and kind of reminds you of a warehouse, basically a long rectangle shape with high ceilings. They have booths along the side and many tables with a bar in the back. There are large screens all over the place for watching your favorite sporting event. We looked over a menu that included your typical bar food. 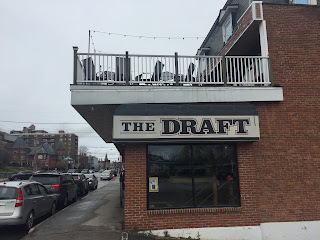 They have a large variety of appetizers such as nachos, fried pickles and soft pretzels along with bone-in and boneless wings, burgers, sandwiches and salads. We checked in with our waitress for some recommendations and she did not seem sure of herself. Hmmm....this is a wings place so maybe for the appetizer we should go for those. 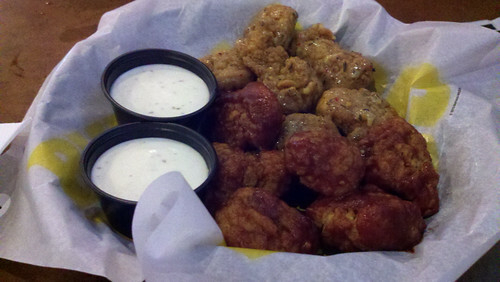 Given that this is a wings place I expected these to be the best I ever had. Admittedly the garlic parmesan were good and the barbecue okay but they were not exceptional. 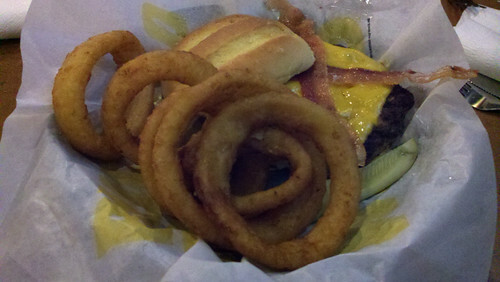 On to the main meal we selected a couple of burgers with cheese and bacon along with their onion rings. When my wife asked for hers medium my heart sank as the waitress informed us that they use frozen meat and that she could only get it medium well. We gave it the benefit of the doubt but we should have tried different items. It was no surprise that the hamburger was not very good. Much like you would expect from a frozen burger, no flavor and dry. So there you have it, we are not wild about the new Buffalo Wild Wings. If you like sports bars with really loud music and don't mind mediocre food then this is your type of restaurant. For everyone else you may want to consider other options.